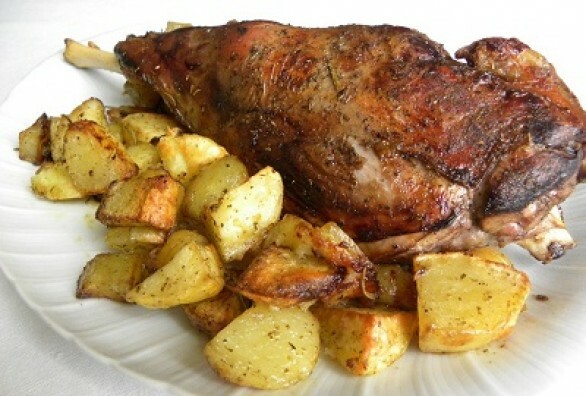 Sardinian Baby Lamb Roast ~ Sardinia Baby! "We’re eating agnello for lunch and there on the table, nestling among the potatoes, is a whole lamb. In Sardinia they slaughter their lamb when it’s only a few weeks old so the sight of this tiny creature in it’s entirety is literally a little difficult for me to swallow. When you have a leg or a shoulder you never envisage the rest of the animal but little imagination is needed to see this little Snowy bouncing around a spring meadow. It does, however, smell divine. Franco comes in with what looks like a bottle of local wine and we sit down for a little pasta before tucking into the meat. Franco and Adele are market traders or ambulanti as they are called in Italian. They do six markets a week getting up at four in the morning to sell a whole array of kitchen utensils. I can’t help thinking it must be a hard life but they look good on it. At least they don’t have to get up in freezing temperatures and brave the cold for ten hours a day like they do in the UK. With the pasta finished it’s time for Snowy. Just as I’m wondering how you carve a small baby lamb Franco supplies the answer. From a drawer in the kitchen he takes out a pair of garden pruning sheers and proceeds to cut up the lamb into large chunks! It is positively medieval. I can’t help thinking how disapproving my mother would be of this obvious display of masculine, carnal butchery. Being so young the meat is almost white and slightly resembles chicken, very different from British lamb that’s much darker and probably comes from New Zealand anyway. It’s extremely tasty and I have to admit that it’s the first time I have had a whole leg to myself, in fact we each have a leg! I tell them about mint sauce and they think it’s an odd thing to eat with lamb. Here they generally like their roast served straight up, no sauces no gravy just potatoes. Vegetables come later in the form of raw carrots, celery and fennel to help digestion. We round off lunch with a homemade tiramisu and a Mirto. Excellent."